On the feast of St. Louise de Marillac, Friday, March 15, 2013, Ms. Vivian Chase went home to be with the Lord. 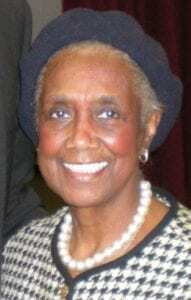 Vivian was a member of the Ladies of Charity at St. Gabriel’s Catholic Church in Washington, DC for over forty years. Over the years, Vivian served as president of the Association of Ladies of Charity for the Archdiocese of Washington as well as the District of Columbia Parish Units. Also, she served as an advisor on the Archdiocesan Board for the Ladies of Charity. Vivian was very active in her community. She loved teaching children and was a volunteer at St. Gabriel’s Catholic School for many years before its closing. She was a tutor for the reading enrichment program at the Kennedy Institute. Vivian was a champion for the underprivileged and disenfranchised. She was dedicated to her faith, community and church family at St. Gabriel’s. Her beautiful smile, giving heart and outspokenness on behalf of the less fortunate will truly be missed. Vivian, we love and miss you, but never will forget you. May you rest in peace, our beloved Lady of Charity.